Truffles are ascomycetes, fungi that shoot their spores from flasks (asci, singular ascus)... but underground? Surely that can't work! The answer is that these kinds of fungi rely on animals digging them up and eating them. Even after the spores have passed through the gut of an animal and been excreted, they are able to produce a new mycelium, which is vital for their reproduction in a new area, provided they can find and link up with the root system of a suitable tree species. Cut a truffle and it gives off a distinctive (but un-mushroomy) smell. Pigs, dogs and other animals with noses more sensitive than ours do not need the truffles to be cut open or even dug up: they can smell them from above ground. This is why professional truffle hunters use either pigs or dogs to help them locate this source of 'black gold'. 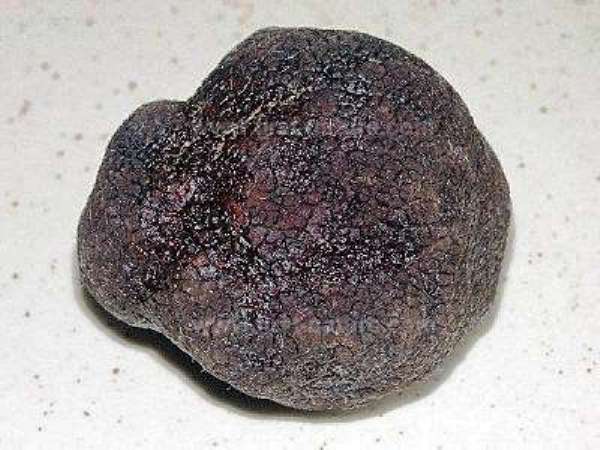 The Périgord Truffle is known to occur in parts of France, Spain and Italy, with small quantities found also in Slovenia and Croatia. So far this species has not been recorded from either Britain or Ireland. Being subterranean, these mushrooms are rarely seen by people walking in woodlands, and so their frequency of occurrence and exact location of sites are a matter of conjecture (and of commercial secrecy if you are a truffle merchant!). The market is never flooded with Périgord Truffles, and so the price remains very high indeed. Périgord Truffles have been grown successfully in Australia, New Zealand and North America, using truffle-inoculated Hazel trees as the mycorrhizal partner. 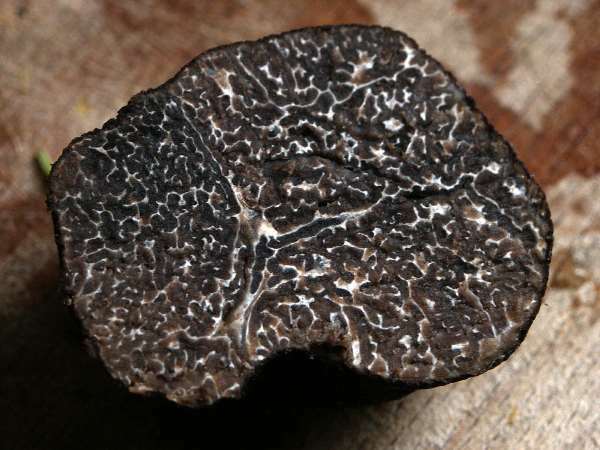 When in 1831 Italian mycologist Carlo Vittadini (1800 - 1865) described the Périgord Truffle he gave it the scientific binomial name Tuber melanosporum, and that is still its generally-accepted scientific name. Synonyms of Tuber melanosporum include Tuber brumale P Micheli, Tuber gulosorum (Scop.) Pico, Tuber nigrum Bull., Tuber cibarium Pers., Tuber cibarium (Bull.) Fr., and Tuber gulonum (Corda) Paoletti. Tuber, the generic name, comes directly from the Latin word tuber, meaning a lump or swelling. The specific epithet melanosporum means 'with black spores'. Typically a few cm across and weighing 50 to 200g each; exceptional specimens weighing over 1kg each are found occasionally. Inside, the dark spore-bearing material is marbled by white membranes in a random wandering way rather than any regular pattern. Light brown to mid brown. Mycorrhizal, mainly found under oak trees, including Cork Oaks, in southern Europe - France, Portugal, Spain and Italy in particular. Also known to occur under Hazel, Hornbeam and very occasionally pine trees. Late summer, autumn and, in the far south of Europe, all through the winter. The Piedmont White Truffle Tuber magnatum has a pale smooth exterior and a cream or ochre interior. 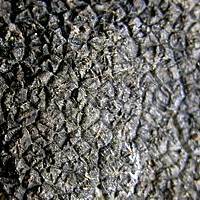 The Summer Truffle Tuber aestivum has a dark brown or black outer skin covered in irregular pyramidal warts. Inside, the spore-bearing material is initially white, becoming beige or grey-brown and marbled by white membranes in a random rather than regular pattern. Périgord Truffles are highly-prized edible fungi. These truffles are so expensive to buy that they are generally shaved very thinly and added sparingly to a meal. One way to make a truffle go further is to extract 'truffle oil' from the fruitbody and use it as a spray. Most so-called truffle oil available in shops does not contain truffles at all but is produced synthetically to replicate (to some degree!) the unique odour of real truffles.